Not really much interesting you can do with this one really. Going through the whole grid while checking every single possibility is really the only way you can do it. 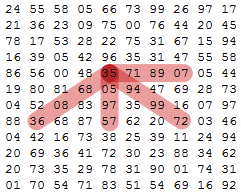 We have take every number in the grid and multiply it with the three numbers to the left of it, below it, diagonally up to the right, and so on, like shown below. However, this way we would actually be checking all the possibilities twice because a product doesn’t care in what order its factors are. This means we can for example just check the ones to the right and not the ones to the left. We then end up with only four of the original eight “arms” of factors to multiply. 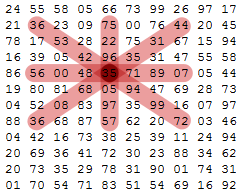 I put the grid in a two dimensional array and then just looped through all of them looking for the highest product. It is very simple to make. Only thing that can be a bit tricky is to make sure you do try out all the possibilities without going out the side the array bounds. Anyways, you can see my result below.